Hello everyone! I had said that for October my goal was to post a new card each day. I think this will come in very handy with Christmas coming and me trying to finish off some card orders for other people. Yesterday was the 1st day of the month however my scheduled post seems to be missing and appears to not have posted, so here I am having to retype it. For those of you who know me know that there have been a lot of baby things happening around me. My niece recently turned 4 months, my boyfriends brother and his girlfriend had twin boys a couple weeks ago and a bunch of my friends are expecting. So naturally because of baby fever I've been working on baby cards because I need to make sure I have some on hand. This post is not one but 2 cards. Both cards started from scraps in my scrap box and evolved from there. In the supplies used section I will link to as many materials as possible, however because some are scraps I don't have links for some items. The image used for each was already cut out and coloured. The little outfit she's holding and her dress were incomplete. 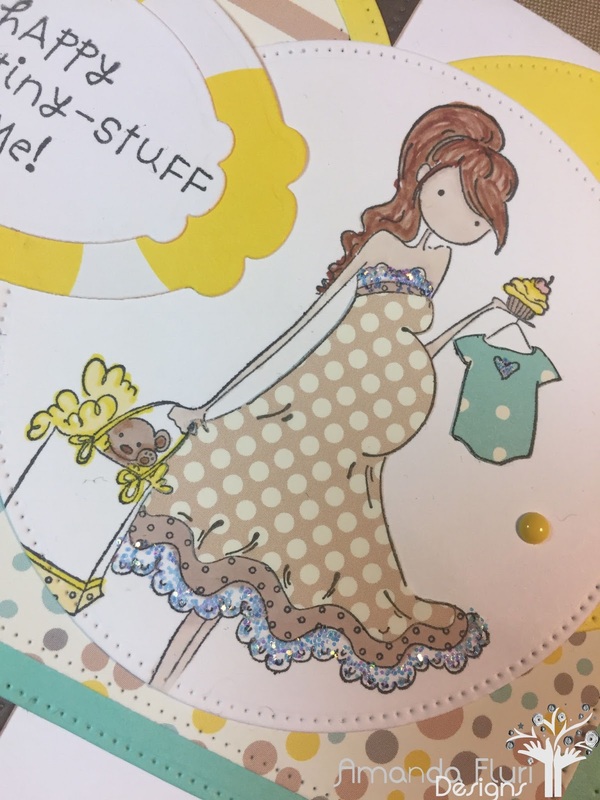 I had the 2 colours of onesies already stamped and in my drawer so I thought it would be perfect to build a card based on that. The solid coloured circles and rings were already cut out as were some of the background pieces, so making these cards came together pretty fast. I used my favourite baby paper packs for the paper and was able to make some amazing cards. Thank you for stopping by to check out my cards, I can't wait to share another card with you tomorrow. Please leave me a comment and let me know what you think of the cards. Paper Trimmer - used to cut paper to size. Tim Holtz Scissors - used to cut out the dresses and onesies. 2 sided tape - used to attach pieces to the card base. Mono Multi - liquid glue used to adhere the circles, dresses, and baby outfit. Acrylic Block - used to adhere the clear stamp to for stampling. 110lb White Cardstock - heavy weight paper for the main images. MFT Black Die Ink - used to stamp the sentiment and image with. Promarkers - used to colour in the images. Stamping Bella Stamp - image used on the cards. Stamping Bella Stamp - used for the sentiment/wording on each card. Cuttlebug - used with the dies to cut all shapes, and layers on the cards. Die-namics Pierced Circle STAX - used to cut the circles on these cards. Die-namic Pierced Rectangle STAX - used to cut the rectangles and the matts for the pattern paper. 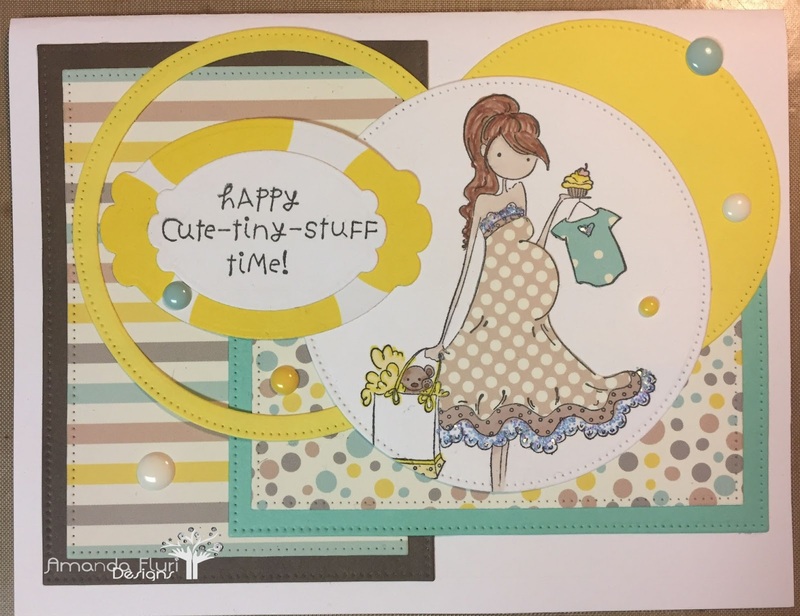 Doodlebug Sprinkles - coloured dots used as accents. Stickles - used to add shimmer to the images. Solid Colours - scrap paper so unfortunately I don't have an exact link, however you could use any solid colours in its place.